Nikos Mavrakis was born in Syros, Greece on March 24th, 1989 to George Mavrakis and Evangelia Preka-Mavraki. Nikos has two older sisters, Anna and Julia. Since Nikos was a child, it was obvious that he is multi-talented. His first contact with acting was at the age of 9, as an active member of the acting group of his primary school. One of the most hilarious moments of his life happened when he was a student at the 5th class of the primary school. While he was performing in a theater play, he forgot his script and he created his own new dialogues! This situation socked and confused the other students- actors, though he made the audience laughing out loudly watching him acting so naturally out of the script. By this fact, everyone understood that he has a really bright future on acting. 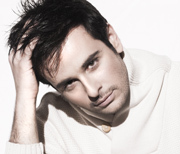 Few years later, he participated in a Pan-Hellenic music competition as the primary singer of the chorus of Syros and he awarded with the first prize. He graduated as the best student of his year from the University of Larissa, Greece from the Department of Medical Laboratories. The duration of these studies is 4 years, but due to the fact that he was an excellent student, he graduated in 3 years with the highest mark. We should also notice that he was the youngest student who has been graduated the Department of Medical Laboratories. Moreover, he took a scholarship to study in the Department of Medicine. Even if this is the dream for many students, Nikos had different personal ambitions. So, he studied in a Drama School named “The Theater Of Changes”, hiding from his family that he dropped out the Medicine School. Only few months after his first steps as a student in the drama school, he took part in his first TV serial, named “The generation of 592 €”. Shortly after completing this participation in the serial, he continued to take part in various TV series and films. His last work in Greece was in the daily serial “Stolen Dreams” on Mega Channel, as Lefterakis. During this running project, he received an offer from the Turkish production company ADAM film to take part in the TV serial “Two sides and One Ismail” on ATV Channel in Turkey. This was a really big opportunity for him to achieve his ambitions, but on the other hand was such a big challenge. He had the opportunity to discover the Turkish culture and the different ways of working at this well-promising film industry. Without doubt, it was a challenging move, with many risks, to act in a language that he couldn’t speak or read. Although, he took the decision to accept this offer and he relocated to Ayvalik in Turkey, as here was the basic place of the shootings. By the end of that serial he took part in a short film named “Lack”. Noticing that he was the only actor in this movie, he awarded with two prizes in two famous film festivals in Turkey. Then, he took part in an American film named “Two faces of January” with Viggo Mortensen , Kirsten Dunst and Oscar Isaac. With multiple projects currently filming or in the production phases, Nikos continues to move forward in his career and look ahead for new opportunities.